Stevia rebaudiana bertoni is a plant belonging to the chrysanthemum family. It is native to South America. Stevia leaves have been used for centuries by the indigenous peoples who added it to bitter medicines and teas. Sunrider Sunectar® supplement is a great choice for maintaining a healthy diet and lifestyle. 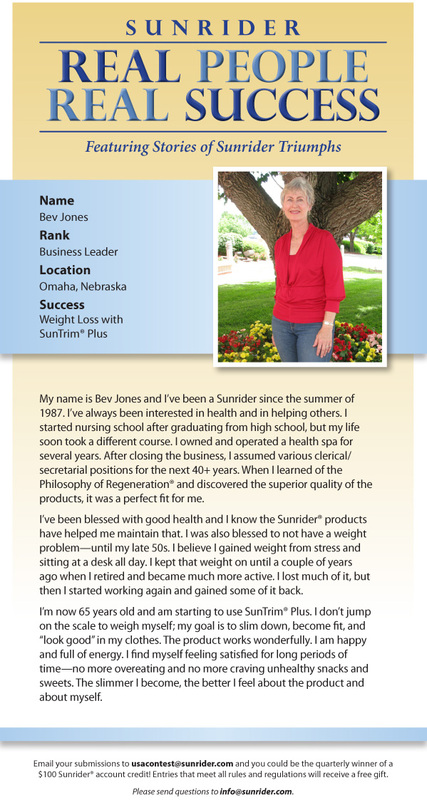 My name is Bev Jones and I’ve been a Sunrider since the summer of 1987. I’ve always been interested in health and helping others. I started nursing school after graduating from high school, but my life soon took a different course. I owned and operated a health spa for several years. After closing the business, I assumed various clerical/secretarial positions for the next 40+years. When I learned of the Philosophy of regeneration and discovered the superior quality of the products, it was a perfect fit for me. I’ve been blessed with good health and I know the Sunrider Products have helped me maintain that. I was also blessed to not have a weight problem-until my late 50s. I believe I gained weight from stress and sitting at a desk all day. I kept that weight on until a couple of years ago when I retired and became much more active. I lost much of it, but then I started working again and gained some of it back. I’m now 65 years old and am starting to use the SunTrim Plus. I don’t jump on the scale to weigh myself; my goal is to slim down, become fit, and “look good” in my clothes. The product works wonderfully. I am happy and full of energy. I find myself feeling satisfied for long periods of time-no more overeating and no more craving unhealthy snacks and sweets. The slimmer I become, the better I feel about the product and about myself. Be the first to review “Sunrider Sunectar” Click here to cancel reply.